Don’t worry, we’re not talking Shakespeare and it’s ‘B’ for baselines – we want to help you understand when a baseline might be required and what it should contain. From January 2019 the EU eSubmissions Roadmap will mandate the use of eCTD format for National Procedures (NP) NP meaning that all submissions (human) in Centralised Procedures (CP), Decentralised Procedures (DCP), Mutual Recognition Procedures (MRP) and now also National Procedures must be submitted in eCTD format and any submissions in NeeS format will be rejected. A baseline submission is often used to effect this conversion. A baseline submission is a compiled submission of the current status of the dossier, i.e. a resubmission of currently valid documents (latest approved versions) that have already been provided to an agency but in another format. The sections provided to make up a baseline can be defined by the applicant, but any omissions should not render the submitted content misleading. A baseline typically consists of the Module 3 documents that tend to change over time during the lifecycle of the product. It is also possible to use multiple sequences to submit a baseline, for example one sequence for the baseline for Module 3 followed later by one sequence for the baseline for Modules 4 and 5. It should be clearly stated in the cover letter of any “baseline eCTD sequence” that the content of the previously submitted dossier has not been changed, only the format. Also, the submission type ”reformat” should be used in the envelope for the baseline sequence. Ideally, if a baseline is submitted we believe that submission of as much content as possible will realise the greatest and most timely benefit both within your own organisations and for regulators such as ourselves. Incomplete baselines create a split view of a product in the reviewing tool which may take a long time to be reflected completely in the new format and make assessment of applications more challenging to achieve in a short timescale. However we also recognise that the increased short-term effort required to create a full baseline could be burdensome for some organisations and product lines. It has always been highly recommended but not mandatory to start a new eCTD dossier with a baseline as this provides a single source of information relating to a product(s) in a technically valid, easily readable structure. This sets a solid foundation (baseline) upon which the lifecycle (history of changes) of a product can be built in the new format. However, it is possible to start an eCTD dossier with any sequence that can be classified as a reformat submission unit. The baseline should always be a separate submission and should never include new applications. Some submission types typically require baselines for effective handling, for example Mutual Recognition and Repeat-Use Procedures and changes of ownership. Also, any change of format during ongoing regulatory activities cannot be processed without either a resubmission sequence or a baseline (see Further Reading below). We expect the mandatory use of eCTD for all submissions from January 2019. In most cases it is for you to decide whether or not to submit a baseline and precisely what content to include and we suggest you evaluate the costs and benefits of those decisions in a risk based way. When you submit a baseline we expect at least Module 3 documents to be included and we expect all technical guidance available at the time of submission to be followed. For an Agency such as ours, handling thousands of applications weekly, a well-structured eCTD dossier and a good lifecycle (history of changes) can reduce both processing and assessment times. For our customers, the benefits have been identified previously in the EU Roadmap as leading to less administrative burden and increased transparency through sustainable, fully end-to-end, electronic processing of information. Ultimately, harmonisation of processes in such a way is expected to lead to technical opportunities to enable and facilitate new ways of collaborative business processing and the re-use of data throughout the medicinal product lifecycle. Good progress has already been made to see the successful use of eCTD format for CP, DCP and MRP and from January 2018 an allowance for the conversion of dossiers from older formats to eCTD whilst there are ongoing regulatory activities pending approval, has been put into place. Previously it was not recommended to switch formats during ongoing regulatory activities however it became necessary to allow this conversion of formats during ongoing MRP submissions to achieve the mandated timelines for responses or new MRP applications in eCTD format. Further guidance on how to do this is provided in the form of a Q&A on the eSubmission CMD documents page. However, we are aware that customers are concerned about how and when to convert the remaining National Procedure dossiers, what this will entail and if a baseline will be required and we hope this blog will help you decide what action to take. If you have any questions relating to this article, please send them to IPUenquiries@mhra.gov.uk with MedRegs eSubmissions Query in the subject line. 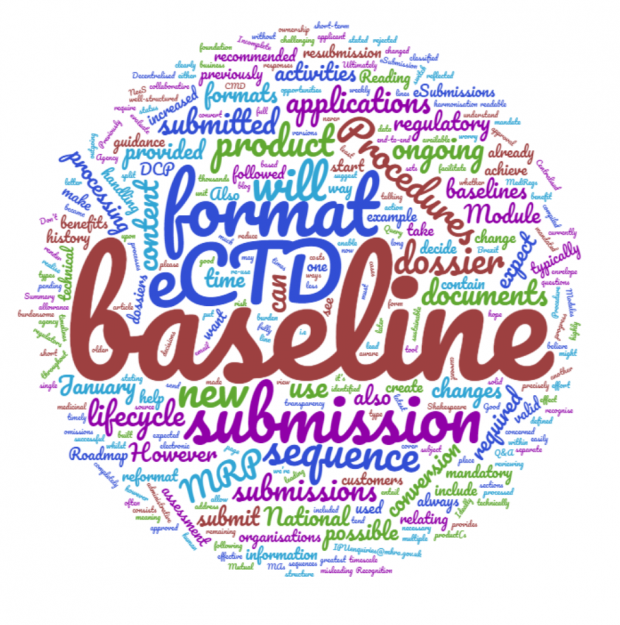 For detailed guidance on baselines, please refer to the EU Harmonised Technical eCTD Guidance 2.4 Moving to eCTD Format from Paper or NeeS Type Applications and 2.12 Technical Baseline Applications.